Before the worship service this past Sunday, I reminded the congregation that this coming Sunday was Reformation Sunday. And that while most years it is a big deal, this year it is a big, BIG deal because it is the 500th commemoration of the Reformation movement that began with the 95 theses Martin Luther first made public on Oct. 31, 1517. I also mentioned that we were almost to our 500th roll of toilet paper that we are collecting for our local food bank’s “October is TP month” drive – a terrific service project for a commemoration of an event started by a guy who had digestive troubles, don’t you think? Each year we Lutherans gather on Reformation Sunday to celebrate our identity and mission. And sometimes, especially to non-Lutherans, the day feels a bit self-serving and self-congratulatory. That is a bit ironic since the identity and mission we celebrate is as people who are incapable and unable do a single thing to get God’s approval – not really something to brag about. And mission? Tell everyone else that good news; Lutherans are not exactly at the top of the list for church outreach. I do think we are inching toward recognizing our hubris. And sometimes, even to lifelong-Lutherans, it feels like we celebrate Scandinavian or German culture as the very white descendants of those true believers. I think we might be millimeter-ing toward recognizing that as well. So, we’ve been celebrating the 500th anniversary commemoration all year. Sometimes we gotten mired in history. But also through this year, a lot of fine people have been asking if that’s all there is – history. Is there any reforming still going on? What does this commemoration have to do with today? Or, more importantly, what does it have to do with tomorrow? One place those fine people used to discuss the meaning of the reformation was in Living Lutheran magazine/ezine from the Evangelical Lutheran Church in America (ELCA). The first chapter is on Martin Luther. The author points out that we Lutherans quote from his extensive writings on the Bible and theology; we teach our children with his Small Catechism; we sing his hymns on many a Sunday. 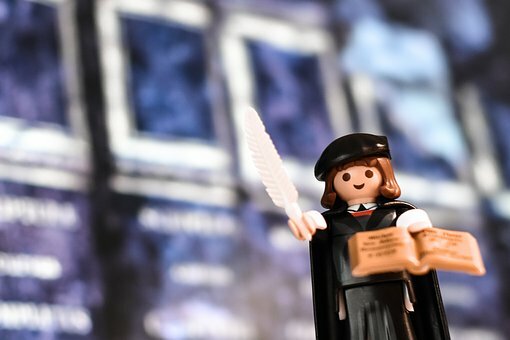 But, in a recent survey of Lutheran congregational leaders, only 8 percent were aware of the fact that Luther had written about or promoted radical reforms in ecology, the economy, education, financial institutions, government, political leadership, and social assistance. Luther called us to pay attention to our neighbor. God does not need your good works, but your neighbor does. You repay the love and support of Christ for you by loving and supporting Christ in his needy ones... by attending to the most vulnerable… by not pushing those in need to the margins. Through the witness of Luther and some recent Lutherans, the authors of this book make their case that Lutheran theology offers foundational resources for participation in socio-political challenge to the status quo in ecology, the economy, education, financial institutions, government, political leadership, and social assistance. And a third way some fine people have been discussing this for several years is through the #decolonizelutheranism movement. These people are asking really hard questions about what and how the Lutheran church needs to reform or even discard. Colonization refers to one group of people having the power of the dominant culture. …people in power in our church are part of a dominant cultural group that wields the power to establish and maintain cultural norms. These cultural norms define what it means “to be Lutheran.” This dominant culture is one of European-American heritage, of Lutheranism brought over mostly from Germany and Scandinavia. But this is not the full picture of what Lutheranism is, locally and globally… We are saying culture and cuisine don’t make us Lutheran, it is our relationship with grace. Their questions/observations/criticism are really challenging. This group offers a way to the future that is possibly as difficult as the reformation 500 years ago. Read their list of reformation goals. On Sunday, we’ll bring out the brass and form our procession. We’ll decorate the church in red, baptize a couple of babies, and a few youths will affirm their baptisms. Oh, and we will sing “A Mighty Fortress is our God”. What is your impression of Lutherans? Where do you think the continuing reformation will take us? As always, you can leave comments or questions below.